� In the 2013 AVP season opener Belov and Roberts advanced from the qualifier and finished fifth, one of three teams that year to advance from the qualifier and place as high as fifth. All four teams they played in the main draw were seeded fifth or higher, and they went 2-2 against them. 2012: Belov debuted on American sand, playing nine events on four different tours. He had a second and third place finish in four tournaments with Dana Camacho. He and Adam Roberts competed five times with a best of seventh. 2011: Belov and Dayanov played in four FIVB tournaments but failed to emerge from the qualifier in any of them. The duo played in a CEV Satellite event and finished seventh. 2010: Belov and Dayanov played 10 FIVB events together, advancing from the qualifier three times with a best of 13th. In their last event of the year, they were seeded directly into the main draw and placed 17th. 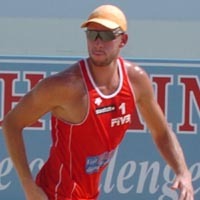 2009: Belov played two FIVB events with Moroz with a best of 33rd. He then formed a partnership with Ruslan Dayanov, and the duo had a best of 41st twice in three events. 2008: Belov entered the pro beach volleyball scene with a pair of FIVB Challenger events alongside Vladimir Moroz, with a best of seventh. The duo also played three FIVB qualifiers, advancing from their third one and finished 17th.